Fishing from the shoreline of Munna Point has been a favorite past time of the holiday makers using the Noosa River Holiday Park since the 1920’s. 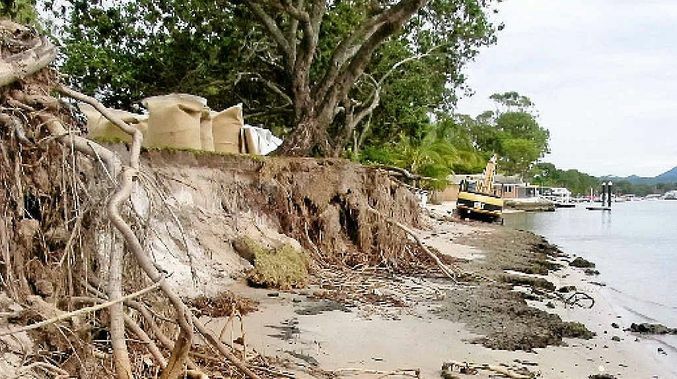 Recently the water’s edge at Munna Point has experienced severe erosion to the point in which the council had to fence off this part of the beach to ensure public safety. 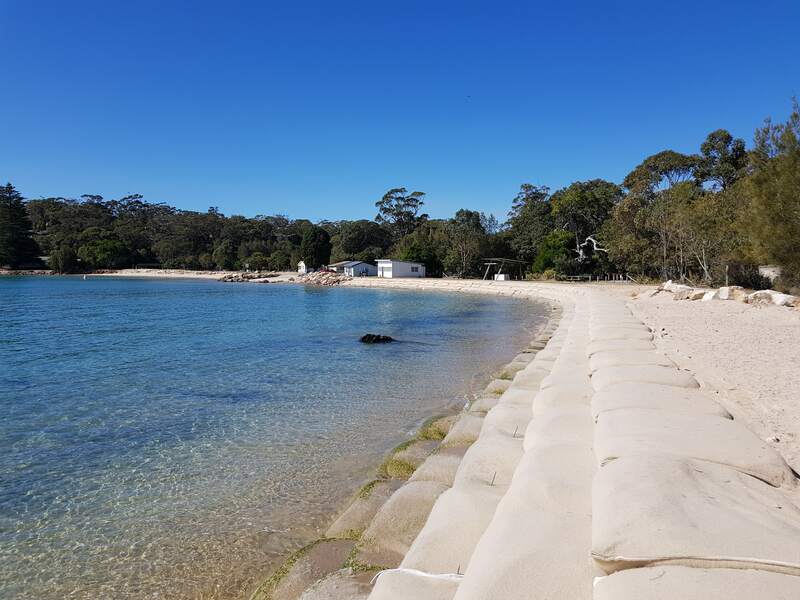 Noosa Council along with consultant International Coastal Management (ICM) developed a solution of combining 15m long groynes made from Geotextile Sand Containers along with sand filled mattresses at the toe of the groynes. The aim was twofold; restore the foreshore and move the channel back to the centre of the river away from the shoreline, thus reducing the scouring. The groynes were constructed using ELCOROCK 4.5 tonne sand containers and the sand filled mattresses were 8 m wide standing 500 mm in height with a length of between 22-26 m.
The installation of both the groynes and the mattresses was carried out by Nabis Dredging. The specially designed mattresses were delivered in panels of 2 m x 22- 26 m in length. Nabis then sewed 4 of these panels together making an 8 m wide unit. The mattresses were placed into position and then sank as the water permeated the material. They were held in place with anchors until they were hydraulically filled using a 6/4 dredge. The 2.5 m3 containers being hydraulically filled, was a process pioneered by Nabis. groyne which overlapped the mattresses. Since the installation of the groynes and the mattresses, the beach has been nourished to a profile that has since been proven to be stable with the groynes, increasing the beach by approximately eight metres along a 110 m strip of beach. The mattresses have a natural sand covering now which will not only protect the shoreline, but will provide the Sand Containers with a longer expected life. Geofabrics and Nabis worked closely to ensure the manufacture, handling and construction happened safely and quickly. The mattresses were a bespoke product and there was a lot of work involved to ensure a product was produced that was not only fillable but was also durable enough to withstand the rigors of a coastal environment.